We hunt hogs on several small properties around Fort Worth. The landowners allow access but often want feeders removed at various times of the year due to other activities on the properties. Setting feeders and building pens is hard work so I quickly grew frustrated and started looking for other options. I started with cheap feeders and didn’t build cattle pens. The feeders lasted about four days before the cattle turned them into mangled pieces of scrap metal. I resorted to “pig pipes” because they were quick and easy to set and we’d had success using them before. It takes the work out of setting up a feeder and they can be moved quickly and easily. The design is simple and a quick trip to the plumbing store and $25 or less can build a solid pig pipe. If you’re willing to search for scraps and throw in some “redneck engineering” you might be able to build them for free or at least close to it. There are no set rules or requirements only a need to get to the end goal of a long, securely closed PVC tube that can be staked on one end. Cut a piece of 4-inch to 6-inch diameter PVC pipe to five feet in length. • Take a slip cap and drill a hole in the end, inserting an eye bolt and securing it. • Slip the cap (with eye bolt) on the pipe, securing it with a few screws. • Slip a female clean-out fitting on the other end of PVC and secure with screws. • Screw a male clean-out cap onto the fitting creating an enclosed tube. • Approximately 18 inches from the clean-out fitting drill one, ½-inch diameter hole in the pipe. • Attach a five-foot chain to the eye bolt using a swivel snap and quick link. • Cut a two- to three-foot section of t-post to serve as a stake. Make sure the chain is securely attached to the eye bolt because it will take some abuse. Load up your pipe, stake and a bag of corn and head out to set the pipe. Hammer the stake in the ground securely and attach the open end of the chain to the stake, leaving the length of the chain loose between the stake and pipe. Fill the pipe with corn by removing the clean-out cap and pouring it in. Make sure you fill it completely so it’s stuffed tight and then replace the clean-out cap and screw it on securely. You can also “supercharge” the pipe by adding a package of dry strawberry Jell-O mix to the corn but it’s not necessary. With one end of the pipe secured firmly to the stake, the pipe lies on the ground waiting for hogs to find it. When setting pipes the first time, throw some excess corn on the ground in the area. Scatter the corn around well, like you’re feeding chickens and cover a good 50-foot radius. This helps draw the hogs in and gets them eating and looking for more food. They’ll follow their noses until they find your new invention. To draw them in even more quickly, dump a pile of soured corn around the pipe. They’ll often show up within hours. The hogs move in and begin bumping the pipe with their heads. When they roll it around a kernel or two of corn falls out and they keep working for food, moving and bumping it, often growing more aggressive by the minute. I’ve caught groups of hogs on game cameras—and monstrous lone boars as well—who’ll stick around working the pipes for food for over an hour. The key is making them work for the food so they stick around for long periods of time. If you drill too many holes, they’ll empty it quickly so stick with one to make the hogs work at getting the corn. The real magic happens when you set multiple pipes with some minor additions. 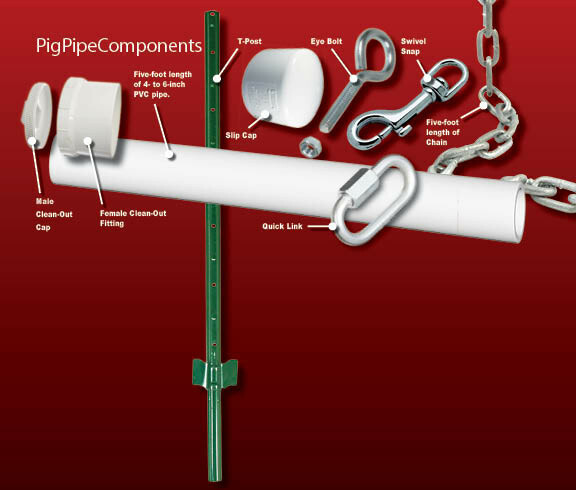 Build multiple pipes and set them where you have hog activity. Keep them in a line or pattern where they’re not bunched up. You’ll want the ability to access one without disturbing the others as much as possible. Keep the pipes within a total spread of two hundred yards end to end. Drill two small holes in the male clean-out cap and secure a cowbell to the outside. I’ll typically use bailing wire wrapped around the handle of the bell and through the holes multiple times. If you’re setting multiple pipes in the area, adding a chemical light stick to the end with the bell works well. Just securely attach it to the pipe with duct tape. Using different colors and alternating them helps to quickly identify locations in the dark if you want to get super-deluxe with your setup. We travel and walk the areas well when setting pipes and go out of our way to leave our scent. It spooks them at first, but they’ll eventually get used to it. This allows you to run out late in the afternoon, refill pipes with corn, add light sticks and not spook everything. Once the line of pig pipes is set, move downwind and sit back a good distance from the pipes, staying as close to the center of the set as possible. You can sit back, relax and wait for the bells to start ringing. When you hear the sound of the cowbell, watch for light sticks dancing around in the darkness. Follow the sound of the bell, and you’ll have the location identified quickly. From there you can move in quickly with a downwind approach and let the lead fly. You’ll be back home with bacon in the morning and will never long for a night vision scope again. The first few times out, the bells can spook the hogs. If you’ll leave them in place and let them warm up to the sound, they’ll be hitting the feeding areas on a regular basis in no time. What started from a need to be mobile with our feeders and reduce workload, turned into a preferred way of setting up for hogs. The only down side is you can’t control feeding times like you can with a timer-controlled feeder. When you use a pig pipe, the pork shows up on their schedule, not yours.